My featured painter today is Sir Lawrence Alma-Tadema. He was born Laurens Alma Tadema in 1836 in Dronrijp, a small West Frisian village in Northern Netherlands. His father Pieter was the village notary and his mother, Hinke Brouwer, the half sister of Pieter’s first wife. To further his career and receive greater remuneration as a notary in a large town, Pieter moved his family to Leeuwarden. The following year, when Laurens was only four years of age, his father died leaving his mother to bring up five young children. His mother, who enjoyed art, decided that Laurens and his siblings should all have drawing lessons and she hired in a drawing master to teach the children. His mother although pleased with Laurens’ artistic ability, wanted him to follow in the footsteps of his late father and study to become a lawyer. Unfortunately, when he was fifteen years old he became seriously ill with consumption and his chance of survival seemed slight. He spent months resting and recuperating at home and during this time he carried on with his art work. Slowly but surely Laurens regained his health and in 1852 abandoned any idea of a legal career and enrolled at the Royal Academy of Fine Arts in Antwerp, where he studied the works of the early Dutch and Flemish masters under the tutelage of the foremost Belgian Romantic painter of the time, Gustave Wappers. Laurens’ art work flourished and he won a number of awards during his four years at the Academy. In his last year at the Academy he began to work closely with Jan de Taeye, one of the professors , who oversaw courses on history and costumes of earlier periods and it was he who introduced Laurens to the world of the Merovingians. Throughout his life Laurens Alma Tadema was fascinated by all things to do with the Merovingians, who ruled over the territory known as Francia and which roughly corresponded to ancient Gaul from the mid sixth to mid eighth century. The Merovingian themes, for Laurens, were his favourite subject for his paintings and drawings up to the mid-1860s. It is perhaps in this series of his paintings that we find the artist moved by the innermost feeling and the strongest mood of romance. However Laurens discovered that Merovingian subjects did not have a wide international charm, so he eventually replaced these themes to that of life in Ancient Egypt that were more popular with the buying public. In 1858 he joined the studio of the Belgium artist and printmaker Henri Leys and it was whilst here that he, with help from Leys, completed his first major work entitled The Education of the children of Clovis which was exhibited at the Artistic Congress in Antwerp to great acclaim in 1861. This painting and the sensation it created launched Laurens’ career and the work itself was purchased and given to King Leopold of Belgium. The year 1863 turned out to be a very traumatic year for Alma-Tadema. His mother passed away in the January and in the following September, he married Marie-Pauline Gressin, the daughter of Eugene Gressin, a journalist who had family ties to the Belgium nobility. The couple spent their honeymoon in Italy, visiting the great art centres of Florence and Rome. They also visited Naples and whilst there went to the ruins of the ancient city of Pompeii. Laurens was fascinated by Pompeii and it was to become the inspiration for many of his later works. The following year, 1864, Laurens was to meet a man who was to have a great influence on the rest of his artistic life. He was Ernest Gambart, the Belgian-born English art publisher and dealer who dominated the London art world in the mid nineteenth century. Gambart was very impressed with the art work of the young Alma-Tadema and commissioned twenty-four paintings from him, three of which he arranged to have exhibited in London. Lauren’s career had by now taken off and his paintings were in great demand and his artistic standing had risen immensely to such a degree that in 1865 for his services to Art, he was named a knight of the Order of Leopold, the highest honour in Belgium. He and his wife had three children, a son and two daughters but their only son died of smallpox at the tender age of six months. Sadly his marriage lasted only six years as Marie-Pauline who had continual health problems died in 1869 of smallpox at the young age of thirty-two. Laurens was devastated, became very depressed, and gave up all his art work for four months. His sister Atje came to live with him so as to look after his children. The health of Alma-Tadema was poor and on the advice of his art dealer friend Ernest Gambart, he travelled to England to seek medical advice. Whilst in London Alma-Tadema was invited to the house of the Pre-Raphaelite painter Ford Madox Brown and it was there that he first met the seventeen year old would-be artist Laura Theresa Epps. For Laurens, it was love at first sight. Alma-Tadema returned home to Belgium. However for a number of reasons he decided to relocate to London, where he was to spend the rest of his life. The Franco-Prussian War had just started on the continent, his mentor Gambert believed he had a much more lucrative future if he established himself in London and of course Laurens could not forget his “young love”, Laura Epps and so he, Atje and the children went to live in London. Once in London he quickly regained contact with Laura and offered to give her painting lessons. It was at one of these lessons that Laurens proposed to Laura and after waiting a year, demanded by her father who had been concerned with the sixteen year age difference of the couple, they married in 1871. As Gambert had predicted Alma-Tadema’s art work was a great success in London and soon he became one of the highest paid and wealthiest artists of his time. Through his art work Alma-Tadema lived a prosperous life in Regent’s Park, London. He became a Royal Academician, which to Laurens was his greatest achievement and was knighted. In 1909 Alma-Tadema’s wife Laura died aged fifty-seven. The artist was distraught that he had now out-lived both his wives. Three years later in 1912, during a trip with his daughter Anna to the Kaiserhof Spa in the German town of Wiesbaden to undergo treatment for stomach ulcers, he became ill and died aged 76. He was buried in the crypt of Saint Paul’s Cathedral in London. However like many things his style of art, which had once been so popular had started to wane and during the last years of his life had completely gone out of fashion with the rise of Post-Impressionism and Cubism. He became the forgotten man and it was not until the 1960’s that his art has become better appreciated and there was a revival of interest in Victorian paintings and Victorian art. My Daily Art Display for today is the very large oil on canvas painting by Alma-Tadema entitled The Finding of Moses. Maybe the painting does not follow true biblical lines; it is still a painstakingly painted account of an Old Testament scene. The artist had travelled to Egypt in 1902 as guest of Sir John Aird to attend the opening of the Aswan Dam, which Aird’s company had just built. Winston Churchill was another member of the party. Sir John commissioned the picture for £5,250, and Alma-Tadema worked on the canvas for two years. 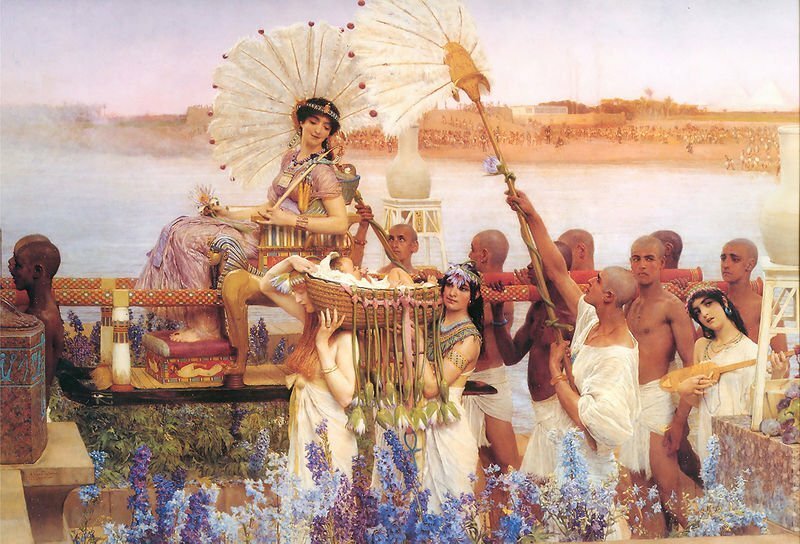 He completed the work in 1904 and it depicts the Pharoah’s daughter in all her regal finery carried aloft by bare-chested slaves on mosaic-covered carrying poles while her olive-skinned handmaidens with their glossy dark braids and the fairer skinned strawberry blondes hoist the baby Moses in his lotus-edged carrying basket so that his new “mother” can gaze down at him. She is at the centre of the painting and one reason for that maybe the fact that it was Aird’s own daughter who modeled for the Pharaoh’s daughter. In her left hand she holds an ostrich feather fan and lotus leaves to keep her cool whilst in her right hand she holds a fox-tailed flail to ward off the flies. The painting is awash with people and this allowed the artist to feature many of figures he had included in some of his earlier paintings. It is amusing to note that according to Percy Standing’s biography of the artist, Alma-Tadema’s wife on seeing the painting commented that the infant Moses was two years old, and therefore need no longer be carried ! To have some idea of how his art work gained in value it is interesting to follow the provenance of this work. Originally sold for £5,250 it failed to reach its reserve price at a Christie’s auction in 1960, the highest bid being a mere £252! Things changed and at the New York auction house, Christies in 1995 it was sold for £1.75 million, which, at that time, was a record for a Victorian painting. However in November 2010 it once again came up for auction at Sotheby’s in New York with a pre-sale estimate of between $3 and $5 million. After an eight minute battle between two telephone bidders it was sold for $35,922,500!!!!!!!!!!!!!!! I remember that the widow of Waterhouse sold his paintings for nearly nothing. this is a beautifull site about Alma Tadema. The wonderful thing with Jonathans artblog here is that it gives a lot of esthetic pleasure and art knowledge ,compliments.!!!! But there is another exellent thing it causes me to further research. So now i,m reseaching why Alma was so interested in Merovingian themes in his 1 period. Here is the answer in this link why Alma Tadema was so interested in the Merovingians. 1.in his hometown regio and house there were archeological remains of the Merovingioan/Frankish p[eriod. 2 By change he did read Gregory of Tours ( good pelican translation ) History of the Franks and he became captivated by Gregory and his history of the Merovingian Franks .